Xu Xiake (Chinese: 徐霞客; pinyin: Xú Xiákè; Wade-Giles: Hsü Hsiak'e, January 5, 1587—March 8, 1641), born Xu Hongzu (徐弘祖), courtesy name Zhenzhi (振之), was a Chinese travel writer and geographer of the Ming Dynasty (1368-1644) known best for his famous geographical treatise, and noted for his bravery and humility. He traveled throughout China for more than 30 years, documenting his travels extensively (which would be compiled posthumously into the The Travel Diaries Xu Xiake, and his work translated by Ding Wenjiang). Xu's writing falls under the old Chinese literary category of 'travel record literature' ('youji wenxue'), which used narrative and prose styles of writing to portray one's travel experiences. With an ancestry in Jiangxi, he was born Xu Hongzu (宏祖), as the second son of Xu Yu'an (徐豫庵, 1545-1694) and Wang Ruren (王孺人, 1545-1625). It was often commented that it was his mother's encouragement for him to travel that shaped Xu's predilections. His sobriquet is Zhenzhi (振之). Xiake was an alternate sobriquet (別號) given to him by his friend Chen Jiru (陳繼儒, 1558-1639) and it means "one who is in the sunset clouds". His other friend, Huang Daozhou (黃道周, 1585-1646), also gave Xu an alternate sobriquet: Xiayi (霞逸), meaning "untrammelled in the sunset clouds." On his journeys throughout China he travelled with a servant called Gu Xing (顧行). He faced many hardships along the way, as he was often dependent on the patronage of local scholars who would help him after being robbed of all his belongings. Local Buddhist abbots of the various places he visited often would pay him money as well, for the small service of recording the history of their local monastery. From the snowy passes of Szechuan, to the semi-tropical jungles of Guangxi, to the mountains of Tibet, Xu Xiake wrote of all his experiences and provided enormous amounts of written detail from his observations. The written work of Xu Xiake's travel records and diaries contained some 404,000 written Chinese characters, an enormous work for a single author of his time. Xu traveled throughout the provinces of China (often on foot) to write his enormous geographical and topographical treatise, documenting various details of his travels, such as the locations of small gorges, or mineral beds such as mica schists (see mineralogy). Xu's work was largely systematic, providing accurate details of measurement, and his work (translated later by Ding Wenjiang) read more like a 20th century field surveyor than an early 17th century scholar. In Guizhou, he made the discovery of the true source of the West River (Xi Jiang) in Guangdong. He was also responsible for the discovery that the Mekong and Salween rivers were in fact separate. 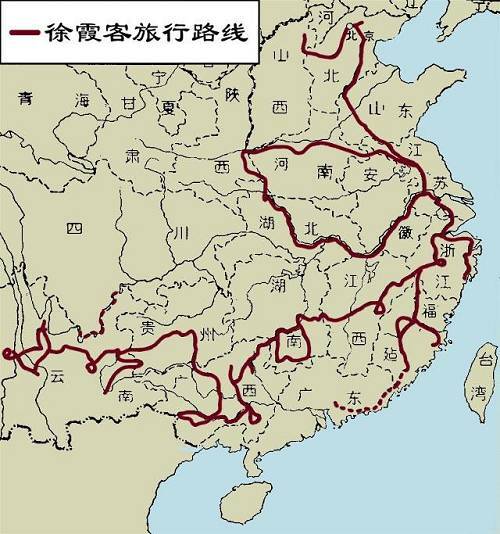 It was because of the confusion of earlier Chinese over the enormous bend and detour of the Lu Nan Shan mountains (south of Ningyuan) that they believed the Jin Sha Jiang River was its own. It was Xu Xiake who discovered that the Jin Sha Jiang was simply the northern section of the Yangtze River.